We won't let crazy weather keep us down! We're excited to announce the new date for our New Year, New Ideas! Come celebrate with us on Tuesday, Feb. 12 and enter in a drawing for a chance to win an Apple iPad! 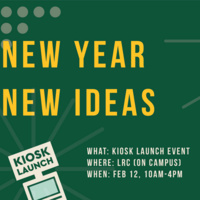 Entries are free and include a spin on the Invent at NMU prize wheel where you can win our signature swag! Instructions on how to win will be posted at the event on the first floor of Northern Michigan University's library. Oh! And like most of our events, complimentary coffee and cookies are provided.